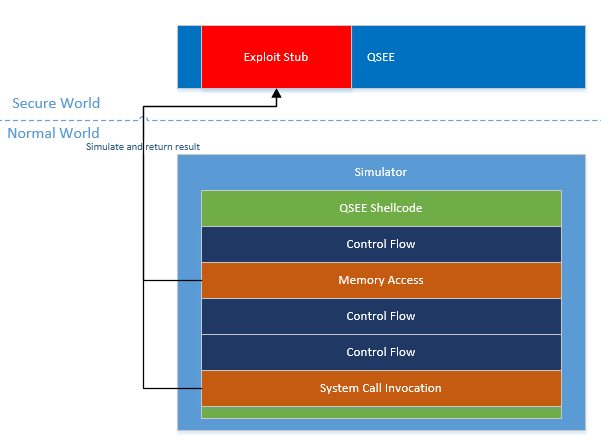 In this blog post we'll discover and exploit a vulnerability which will allow us to gain code execution within Qualcomm's Secure Execution Environment (QSEE). I've responsibly disclosed this vulnerability to Google and it has been fixed - for the exact timeline, see the "Timeline" section below. As we've seen in the previous blog post, Qualcomm's TrustZone implementation enables the "Normal World" operating system to load trusted applications (called trustlets) into a user-space environment within the "Secure World", called QSEE. This service is provided to the "Normal World" by sending specific SMC calls which are handled by the "Secure World" kernel. However, since SMC calls cannot be invoked from user-mode, all communication between the "Normal World" and a trustlet must pass through the "Normal World" operating system's kernel. Having said that, regular user-space processes within the "Normal World" sometimes need to communicate with trustlets which provide specific services to them. For example, when playing a DRM protected media file, the process in charge of handling media within Android, "mediaserver", must communicate with the appropriate DRM trustlet in order to decrypt and render the viewed media file. Similarly, the process in charge of handling cryptographic keys, "keystore", needs to be able to communicate with a special trustlet ("keymaster") which provides secure storage and operation on cryptographic keys. So if communicating with trustlets requires the ability to issue SMCs, and this cannot be done from user-mode, then how do these processes actually communicate with the trustlets? The answer is by using a Linux kernel device, called "qseecom", which enables user-space processes to perform a wide range of TrustZone-related operations, such as loading trustlets into the secure environment and communicating with loaded trustlets. However! Although necessary, this is very dangerous; communication with TrustZone exposes a large (!) attack surface - if any trustlet that can be loaded on a particular device contains a vulnerability, we can exploit it in order to gain code execution within the trusted execution environment. Moreover, since the trusted execution environment has the ability to map-in and write to all physical memory belonging to the "Normal World", it can also be used in order to infect the "Normal World" operating system's kernel without there even being a vulnerability in the kernel (simply by directly modifying the kernel's code from the "Secure World"). This means that if we manage to get a hold of any of these four processes, we would then be able to directly attack any trustlet of our choice, directly bypassing the Linux kernel in the process! In fact, this is exactly what we'll do - but we'll get to that later in the series. I haven't been able to confirm the exact scope of this issue. I've statically checked quite a few devices (such as the Droid Turbo, Nexus 6, Moto X 2nd Gen), and they were all vulnerable. In fact, I believe the issue was very wide-spread, and may have affected most Qualcomm-based devices at the time. So why was this issue so prevalent? As we'll see shortly, the vulnerability is contained in a trustlet and so does not rely on the TrustZone kernel (which tends to change substantially between SoCs), but rather on code which is designed to be able to execute in the same manner on many different devices. As such, all devices containing the trustlet were made vulnerable, regardless of their SoC. Also note that on some devices the vulnerable code was present but appeared slightly different (it may have been an older version of the same code). Those devices are also vulnerable, although the indicators and strings you might search for could be slightly different. This means that if you're searching for the exact strings mentioned in this post and don't find them, don't be dissuaded! Instead, reverse-engineer the trustlet using the tools from the previous blog post, and check for yourself. Previously, we decided to focus our research efforts on the "widevine" trustlet, which enables playback of DRM encrypted media using Widevine's DRM platform. This trustlet seems like a good candidate since it is moderately complex (~125KB) and very wide-spread (according to their website, it is available on over 2 billion devices). As we can see, the first 32-bit value in the command is used to specify the command code, the high-word of which is used to sort the commands into four different categories. Taking a peek at each of the category-handling functions reveals that the categories are quite rich - all in all, there are about 70 different supported commands - great! However, going over 70 different commands would be a pretty lengthy process - perhaps we can find a shortcut that'll point us in the right direction? For example, maybe there's a category of commands that were accidentally left in even though they're not used on production devices? So... Nobody is using 5X commands. Suspicious! Finally, we found a vulnerability! After some simple validation (such as checking that the first DWORD in the command buffer is indeed zero), the function checks the value of the fourth DWORD in our crafted command buffer. As we can see above, setting that value to zero will lead us to a code-path in which a fully-controlled copy is performed from our command buffer into some global buffer, using the third DWORD as the length argument. Since this code-path only performs the vulnerable memcpy and nothing else, it is much more convenient to deal with (since it doesn't have unwanted side-effects), so we'll stick to this code-path (rather than the one above it, which seems more complex). 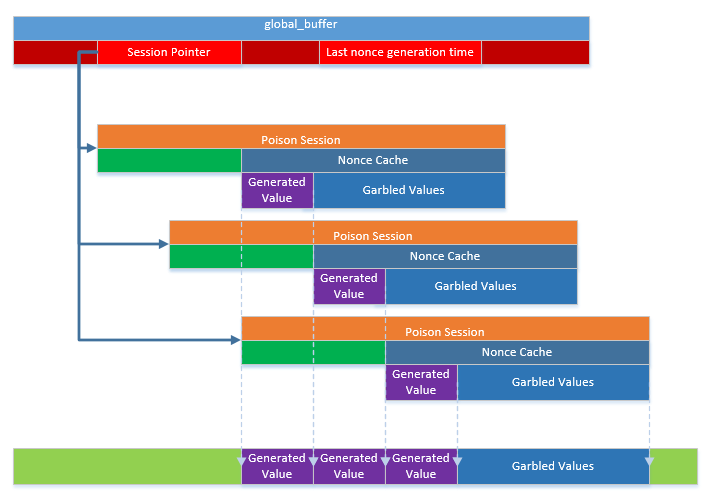 Moreover, you might be wondering what is the "global buffer" that's referred to in the function above. After all, it looks a little strange - it isn't passed in to the function at any point, by is simply referred to "magically", by using the register R9. Disappointingly, nearly all of these functions don't perform any "meaningful" operations of the controllable pieces of data. Specifically, the vast majority of these functions simply store file-system paths in those memory locations, which imply no obvious way to hijack control flow. Since there aren't any function pointers or immediate ways to manipulate control flow directly after the overflown buffer, we'll need to upgrade our buffer overflow primitive into a stronger primitive before we can gain code execution. As you can see above, the block of 0x32 DWORDs, starting at offset 0x169C, are used to store "sessions". Whenever a client sends commands to the Widevine trustlet, they must first create a new "session", and all subsequent operations are performed using the specific session identifier issued during the session's creation. This is needed, for example, in order to allow more than a single application to decrypt DRM content at the same time while having completely different internal states. In any case, as luck would have it, the sessions are complex structures - hinting that they may be used in order to subtly introduce side-effects in our favour. They are also within our line-of-fire, as they are stored at an offset greater than that of the overflown buffer. But, unfortunately, the 0x32 DWORD block mentioned above only stores the pointers to these session objects, not the objects themselves. This means that if we want to overwrite these values, they must point to addresses which are accessible from QSEE (otherwise, trying to access them will simply result in the trustlet crashing). In order to craft legal session pointers, we'll need to find out where our trustlet is loaded. Exploring the relevant code reveals that QSEOS goes to great lengths in order to protect trustlets from the "Normal World". This is done by creating a special memory region, referred to as "secapp-region", from which the trustlet's memory segments are carved. This area is also protected by an MPU, which prevents the "Normal World" from accessing it in any way (attempting to access those physical addresses from the "Normal World" causes the device to reset). 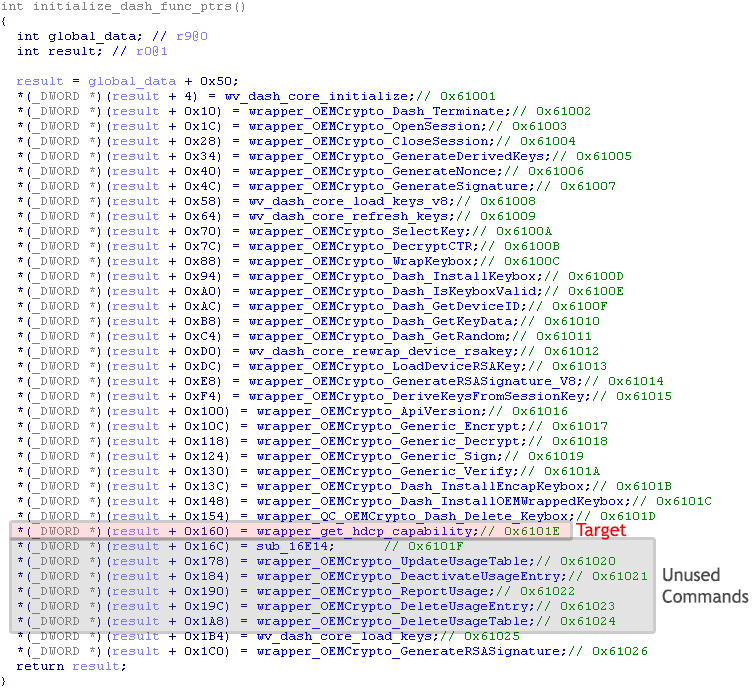 On the other hand, trustlets reside within the secure region and can obviously access their own memory segments. Not only that, but in fact trustlets can access all allocated memory within the "secapp" region, even memory belonging to other trustlets! However, any attempt to access unallocated memory within the region results in the trustlet immediately crashing. ...Sounds like we're beginning to form a plan! We can use the overflow primitive in order to overwrite a session pointer to a location within the "secapp" region. Now, we can find a command which causes a read attempt using our poisoned session pointer. If the trustlet crashes after issuing the command, we guessed wrong (in that case, we can simply reload the trustlet). Otherwise, we found an allocated page in the "secapp" region. But... How do we know which trustlet that page belongs to? We already have a way to differentiate between allocated and unallocated pages. Now, we need some way to distinguish between pages based on their contents. Okay! This function tries to access the data at session_pointer + 0xDA. If that value is equal to one, it will return the value 24, otherwise, it will return 35. This is just like finding a good watermelon; by "tapping" on various memory locations and listening to the "sound" they make, we can deduce something about their contents. Now we just need to give our trustlet a unique "sound" that we can identify by tapping on it. Now, we can simply write this pattern to the trustlet's data segment by using over overflow primitive, effectively giving it its own distinct "sound". Of course, inspecting the allocation scheme used by QSEOS could allow us to speed things further by only checking relevant memory locations. For example, QSEOS seems to allocate trustlets consecutively, meaning that simply scanning from the end of the "secapp" region to its beginning using increments of half the trustlet's size will guarantee a successful match. Now that we have a way to find the trustlet in the secure region, we are able to craft "valid" session pointers, which point to locations within the trustlet. Next up, we need to find a way to create a write primitive. So... are there any functions which write controllable data into a session pointer? This function generates a random DWORD to be used as a "nonce", then checks if enough time elapsed since the previous time it was called. 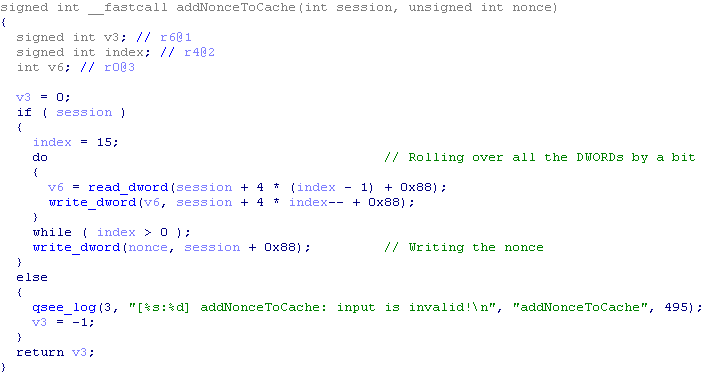 If so, it adds the random value to the session pointer by calling "addNonceToCache". First of all, since the "time" field is saved in the global buffer after our overflown buffer, we can easily clear it using our overflow primitive, thus removing the time limitation and allowing us to call the function as frequently as we'd like. 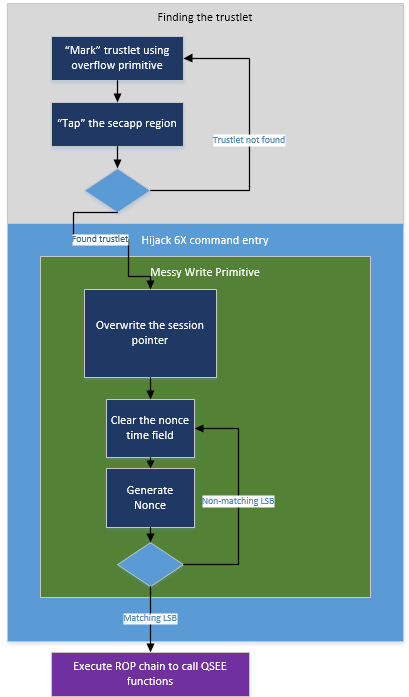 Also, note that the generated nonce's random value is written into a buffer which is returned to the user - this means that after a nonce is generated, the caller also learns the value of the nonce. 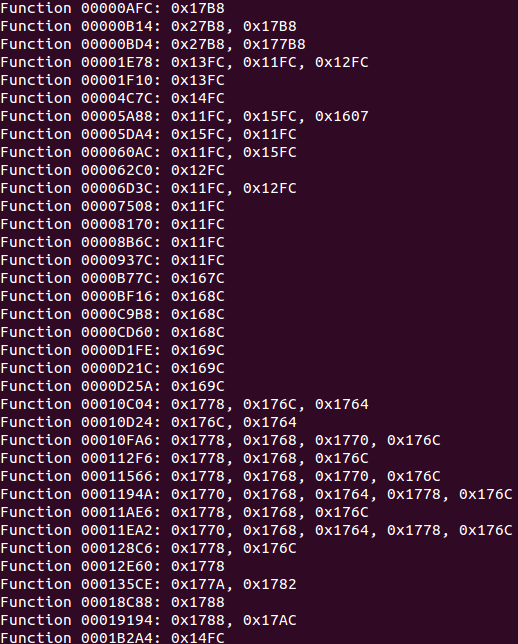 So there's an array of 16 nonces in the session object - starting at offset 0x88. Whenever a nonce is added, all the previous nonce values are "rolled over" one position to the right (discarding the last nonce), and the new nonce is written into the first location in the nonce array. See where we're going with this? 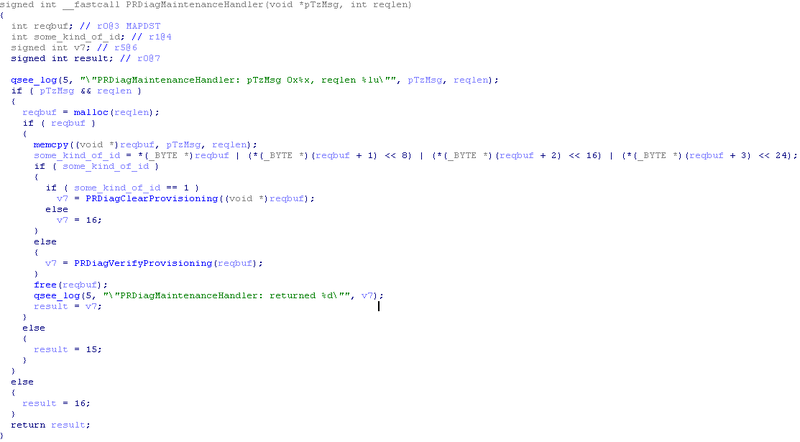 This is actually a pretty powerful write primitive (albeit a little messy)! Whenever we want to write a value to a specific location, we can simply set the session pointer to point to that location (minus the offset of the nonces array). Then, we can start generating nonces, until the least-significant byte (this is a little-endian machine) in the generated nonce matches the byte we would like to write. Then, once we get a match, we can increment the session pointer by one, generate the next byte, and so forth. This allows us to generate any arbitrary value with an expectancy of only 256 nonce-generation calls per byte (since this is a geometric random variable). But at what cost? 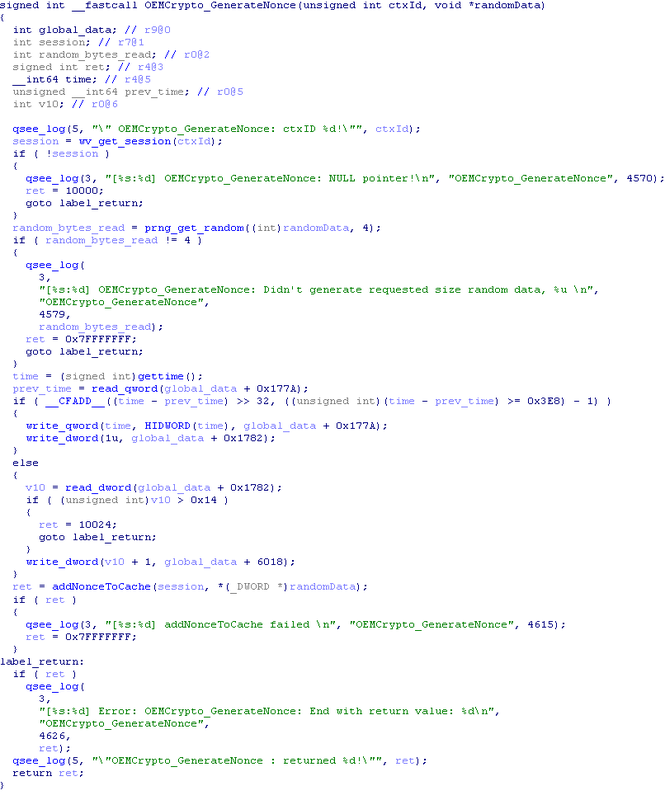 Since the values in the nonce cache are "rotated" after every call, this means that we mess-up the 15 DWORDs after the last written memory location. We'll have to work our way around that when we design the exploit. We finally have enough primitives to craft a full exploit! All we need to do is find a value that we can overwrite using the messy write primitive, which will allow us to hijack the control flow of the application. If this information is valid, the function pointer is executed, passing in the user's input buffer as the first argument and the output buffer as the second argument. If we choose an innocuous 6X command, we can overwrite the corresponding entry in the array above so that its function pointer will be directed at any piece of code we'd like to execute. Then, simply calling this command will cause the trustlet to execute the code at our controlled memory location. Great! There are six consecutive entries corresponding to unused functions. Therefore, if we choose to overwrite the entry directly before them, we'll stay out of trouble. Although we can now hijack the control flow, we still can't quite execute arbitrary code within QSEE yet. 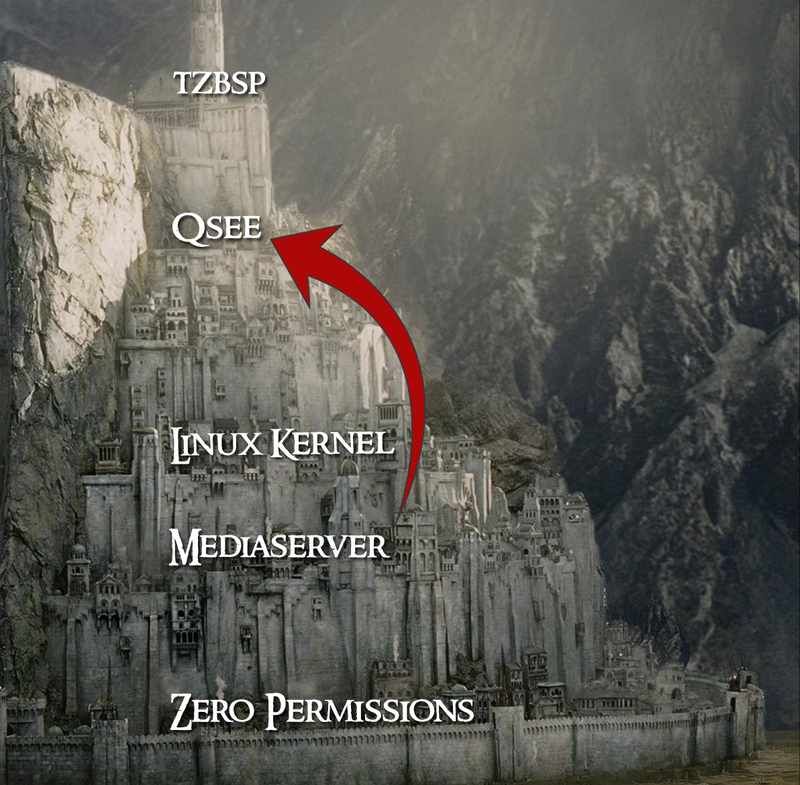 The regular course of action at point would probably be to find a stack-pivot gadget and write a short ROP chain which will enable us to allocate shellcode - however, since the trustlets' code segments aren't writeable, and the TrustZone kernel doesn't expose any system call to QSEE to allow the allocation of new executable pages, we are left with no way to create executable shellcode. So does this mean we need to write all our logic as a ROP chain? That would be extremely inconvenient (even with the aid of automatic "ROP"-compilers), and might even not be possible if the ROP gadgets in the trustlet are not Turing-Complete. Luckily, after some careful consideration, we can actually avoid the need to write longer ROP chain. If we think of our shellcode as a Turing Machine, we would like to create a "Universal Turing Machine" (or simulator), which will enable us to execute any given shellcode as if it were running completely within QSEE. These operations must execute within QSEE. However, we can actually execute both of these operations in QSEE by writing one small ROP chain! As you can see, all this chain do is to enable us to execute any given QSEE function using any supplied arguments. But how can we use it to simulate the special operations? Well, since all system-calls in QSEE have matching calling-stubs in each trustlet, we can use our ROP chain to execute any system call with ease. As for memory accesses - there is an abundance of QSEE functions which can be used as read and write gadgets. Hence, both operations are simple to execute using our short ROP chain. This also means that executing arbitrary shellcode in QSEE doesn't require any engineering effort! All the shellcode developer needs to do is to delegate memory accesses and system calls to specific APIs exposed by the exploit. The rest of the shellcode's logic can remain unchanged and execute completely in the "Normal World". We'll see an example of some shellcode using this model shortly. In order to execute a ROP chain, we need to find a convenient stack-pivot gadget. When dealing with large or medium-sized applications, this is not a daunting task - there is simply enough code for us to find at least one gadget that we can use. However, since we're only dealing with ~125KB of code, we might not be that lucky. Not only that, but at the point at which we hijack the control flow, we only have control over the registers R0 and R1, which point to the input and output buffers, respectively. After fully disassembling the trustlet's code we are faced with the harsh truth - it seems as though there is no usable stack pivot using our controlled registers. So what can we do? 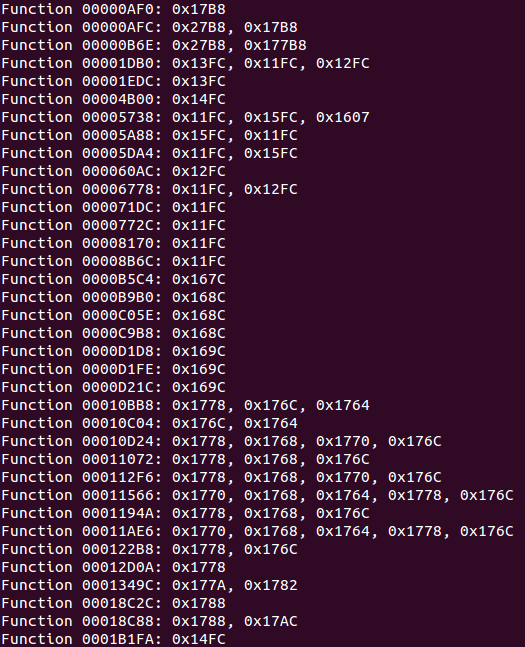 Recall that ARM opcodes can be decoded in more than one way, depending on the value of the T bit in the CPSR. When the bit is set, the processor is executing in "Thumb" mode, in which the instruction length is 16-bits. Otherwise, the processor is in "ARM" mode, with an instruction length of 32-bits. We can easily switch between these modes by using the least-significant bit of the PC register when performing a jump. If the least-significant bit is set, the T bit will be set, and the processor will switch to "Thumb" mode. Otherwise, it will switch to ARM mode. 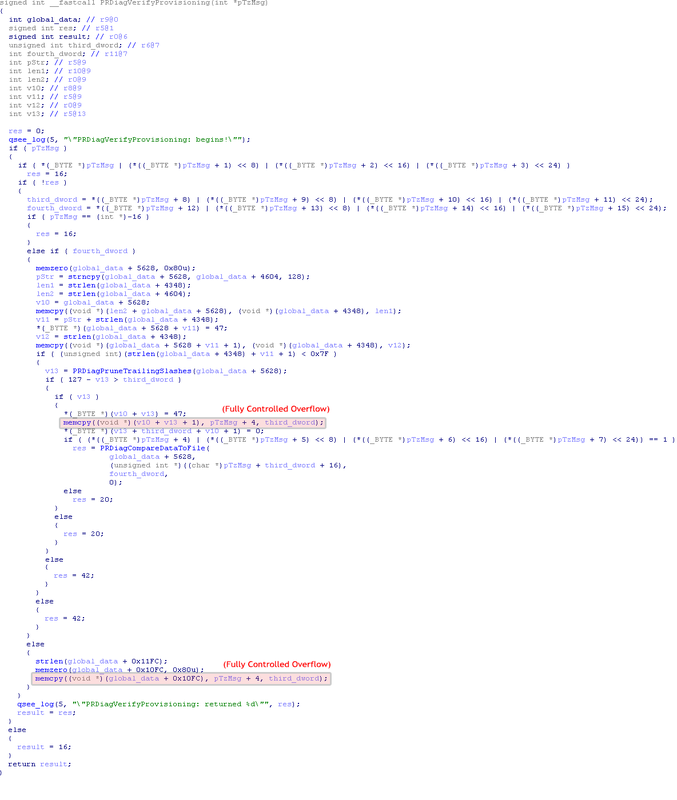 Looking at the trustlet's code - it seems to contain mostly "Thumb" instructions. But perhaps if we were to forcibly decode the instructions as if they were "ARM" instructions, we'd be able to find a hidden stack pivot which was not visible beforehand. By executing this opcode, we will be able to fully control the stack pointer, program counter and other registers by using the values stored in R0 - which, as we saw above, points to the fully user-controlled input buffer. Great! You can find the complete ROP chain and gadgets in the provided exploit code, but I imagine it's exactly what you'd expect. Find the Widevine application by repeatedly "tapping" the secapp region and "listening"
Execute any arbitrary code using a small ROP chain under the "Universal Shellcode Machine"
I've also included a sample shellcode using the model described earlier. The shellcode reads a file from TrustZone's secure file-system - SFS. This file-system is encrypted using a special hardware key which should be inaccessible to software running on the device - you can read more about it here. Regardless, running within the "Secure World" allows us to access SFS fully, and even extract critical encryption keys, such as those used to decrypt DRM content. Also, please note that there are quite a few small details that I did not go into in this blog post (for brevity’s sake, and to keep it interesting). 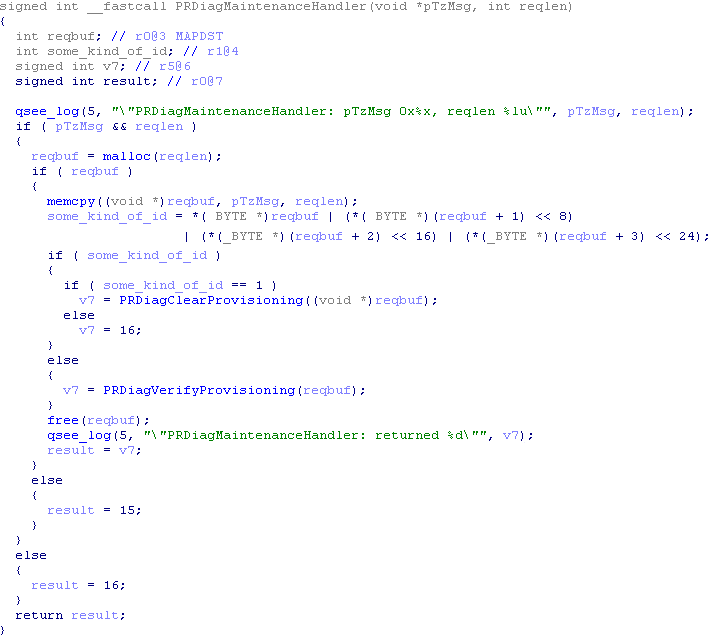 However, every single detail is documented in the exploit's code. So by all means, if you have any unanswered questions regarding the exploit, I encourage you to take a look at the code and documentation. Although we have full code-execution within QSEE, there are still some things beyond our reach. Specifically, we are limited only to the API provided by the system-calls exposed by the TrustZone kernel. For example, if we were looking to unlock a bootloader, we would probably need to be able to blow the device's QFuses. This is, understandably, not possible from QSEE. With that in mind, in the next blog post, we'll attempt to further elevate our privileges from QSEE to the TrustZone kernel! I would also like to mention that on 19.10.2015 I was notified by Google that this issue has already been internally discovered and reported by Qualcomm. However, for some reason, the fix was not applied to Nexus devices. Moreover, there are quite a few firmware images for other devices (such as the Droid Turbo) that I've downloaded from that same time period that appeared to still contain the vulnerability! This suggests that there may have been a hiccup when internally reporting the vulnerability or when applying the fix. Regardless, as Google has included the issue in the bulletin on 14.12.2015, any OEMs that may have missed the opportunity to patch the issue beforehand, got another reminder. Do you know where Widevine is located on a Motorola Droid Maxx? Or at least how to locate it? It has it, however I can not find it. All the other TrustZone apps are stored in /firmware/image, however I do not see Widevine there. Ah, that's surprising - only device I've seen without it. Here's something else you can try: QC added the PRDiag commands to other trustlets as well, so you can search to see if any of them are vulnerable using "grep -r PRDiag /"
The only one with PRDiag is tzapps. Also, my phone apparently still has support for widevine though. The .jar for it is there. The same vuln should work, but you'll need a new exploit (since the wv sessions won't be there, etc.). Actually, upon looking at tzapps, it seems that tzapps IS widevine..
Or maybe not..it does have a lot of widevine references though. I think it would, but I've never checked it specifically. Feel free to search for "PRDiag" in the firmware image to make sure. PLEASE try this if you can! And how do I search for PRDiag? Sorry just don't understand that haha. Can we use this to achieve root on devices with Marshmallow? 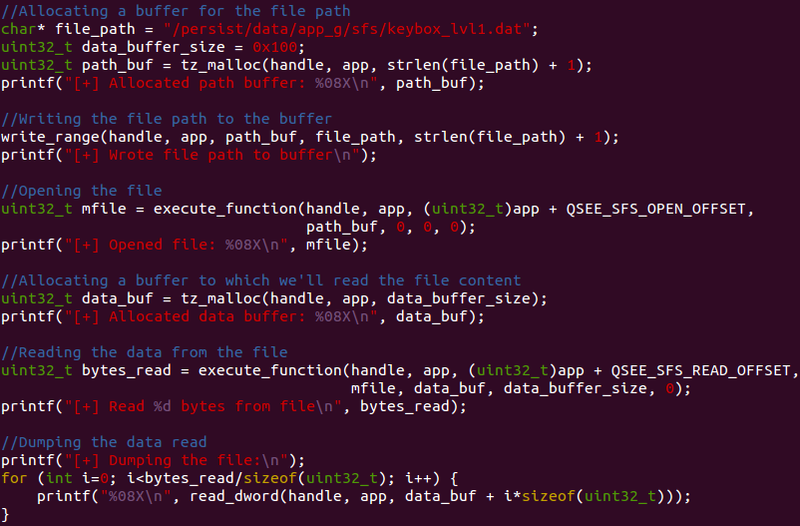 Sure, the Android version doesn't really matter - QSEE can infect any running kernel. Is this SFS encryption used on modemst1 and modemst2 to encrypt NV values? I did some research in the past into the modemst1 and modemst2 filesystems, but this was a long time ago and probably not 100% accurate (since reversing QDSP6 is hard and time-consuming). IIRC, the modemst filesystems use something called EFS2 which relies on a processor-specific hardware key. SFS uses a hardware-key from the application processor, but EFS uses a hardware-key from the baseband processor. 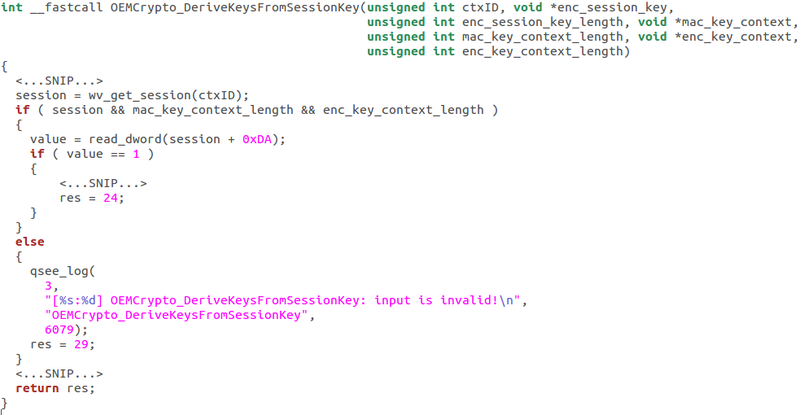 You mentioned SFS uses a HBK, would this be the same key that is used to encrypt the device when encryption is enabled? It was my understanding that the Crypto Core0 only had access to the key, much like a TPM it would never expose the key. Indeed modem reversing is hard, the architecture is a little like ARM, in your experience, how much trust does the modem have? Can the modem access the QFPROM region? Or configure the XPU? I don't think SFS uses the same key used for device encryption (the patent mentions the device-specific hardware key "52" in regards to SFS). Also, yes - the hardware keys are supposed to be accessible only to the Crypto Core (although this could be something interesting to research in order to make sure). As for the modem - I've done quite a lot of research into it and the MBA module; both seem to have very little amounts of "trust" - no XPU or QFPROM access. On the other side, the TrustZone kernel should be able to configure the XPUs, which would enable access to the modem's memory from the TZ kernel (however, I haven't been able to access any XPU-protected region from the TZ kernel yet - I have no idea how the XPUs work and reversing the responsible TZ code takes a long time). Cheers for your reply, indeed some more research does need to completed. A little off topic, will you be at BlackHat this year? I'd love to meet you! I might get around to it later this year, it does sound like an interesting thing to check out. Also, unfortunately I won't make it to BH this year since it overlaps the exam season, but I'd love to chat as well. Perhaps I'll see you later in another con? How did you map out/get symbols for the various widevine command codes? aka how did you produce widevine_commands.h? By reversing Widevine's code. There are quite a few logs left in the code which helped, but there are three functions that I couldn't figure out (or were unused), but maybe their names exist in older versions of Widevine (I didn't check). Also - some commands didn't have names in the Widevine application itself, but did have names in the calling libraries (like the OEMCrypto* family of functions). Hey..Question if you don't mind..What would I be looking for in tzapps to exploit it in a similar manner to this? 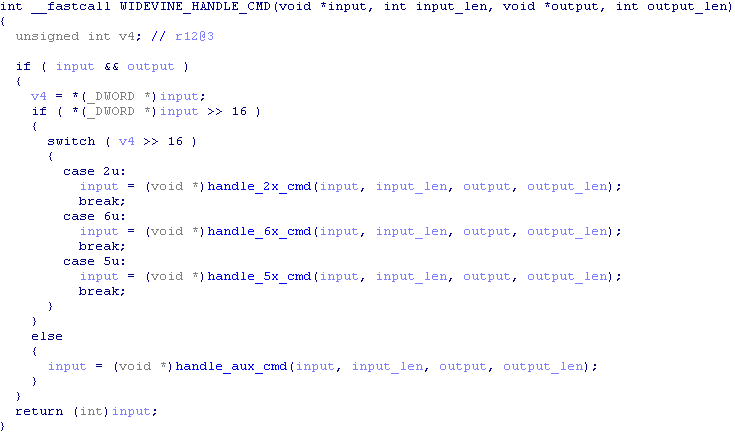 Hey, I downloaded the newest drivers of qcom-shamu from https://developers.google.com/android/nexus/drivers#dragonmxc89f and found there is no difference below the key code you mentioned here, seems like this is not fixed? It's fixed in the official firmware images (see https://developers.google.com/android/nexus/images) and in the OTA images. Anyway, I think you're right, apparently the fix wasn't applied to the Nexus 6 after all. Thank you for your vigilance! This is really surprising, especially since I initially reported it to Google with regards to the Nexus 6 specifically, and the fix should have been included in the January 2016 update. I don't quite understand why this happened... The duo article covering the vulnerability (https://duo.com/blog/sixty-percent-of-enterprise-android-phones-affected-by-critical-qsee-vulnerability) states that 60% of Android devices are still vulnerable, so it seems like this vulnerability is here to stay for a while. Could you please update me as to whether or not you are reporting this to Google? Obviously this needs to be fixed. Hi again. Sorry for bugging you before, but I have found the Widevine location for the LG G5. It is located in "/system/vendor/firmware/widevine.mdt". What exactly do I do with this? Also, I keep getting this error whenever I try and run the code: "[-] Failed to load Widevine: Bad file descriptor"
Unfortunately root is not available for my device at this time, how can I run it as media? For that you'll need a mediaserver vulnerability. I'm releasing one for all Android devices and versions soon. Hi laginimaineb! Thanks for your great articles. Could you explain how did you find the value SECURE_APP_REGION_START and size of the whole secapp region available for memory allocation for the trustlets, please? Is this values are same for all Qualcomm's SoCs? What is the probability of allocation of the same memory region after trustlet to be crashed while searching location of the trustlet ? Hi, To enable Widevine Level 1 on HDMI is it mandatory have to HDCP enabled and provisioned on the Qualcomm processor? Thanks for the awesome article! 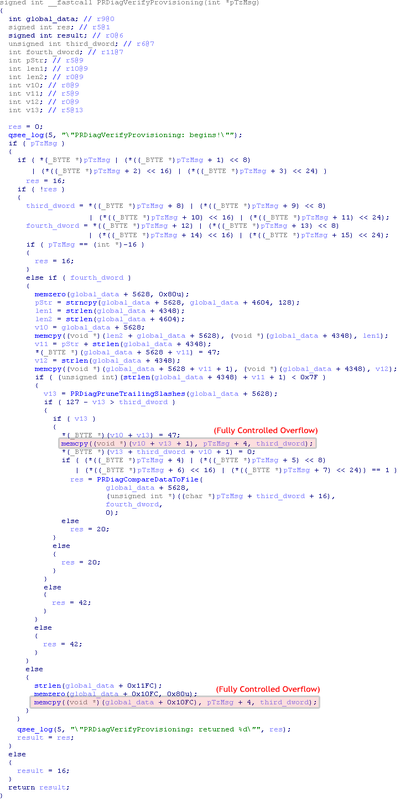 The firmware image you linked on the previous article (https://dl.google.com/dl/android/aosp/shamu-lmy48m-factory-336efdae.tgz) now points to patched version of the firmware. I am trying to reproduce this exploit and could you please share the exact vulnerable firmware image that you used? Thanks alot! I have following three questions. Could you please answer them for me? 1. Does this trusted app running in secure wold has page tables? if so, is it 2 level page table? 2. Do you know how MMU translates the virtual address to physical address in QSEE? Incase of TLB miss, it checks TTBR to find second level page table and from second level page table, it finds the physical address? 3. RAM is divided into secure RAM (for secure world) and non secure RAM (non secure world), right? Is it possible to find the physical address range of secure RAM? 1. It does, but I haven't looked at them in depth. 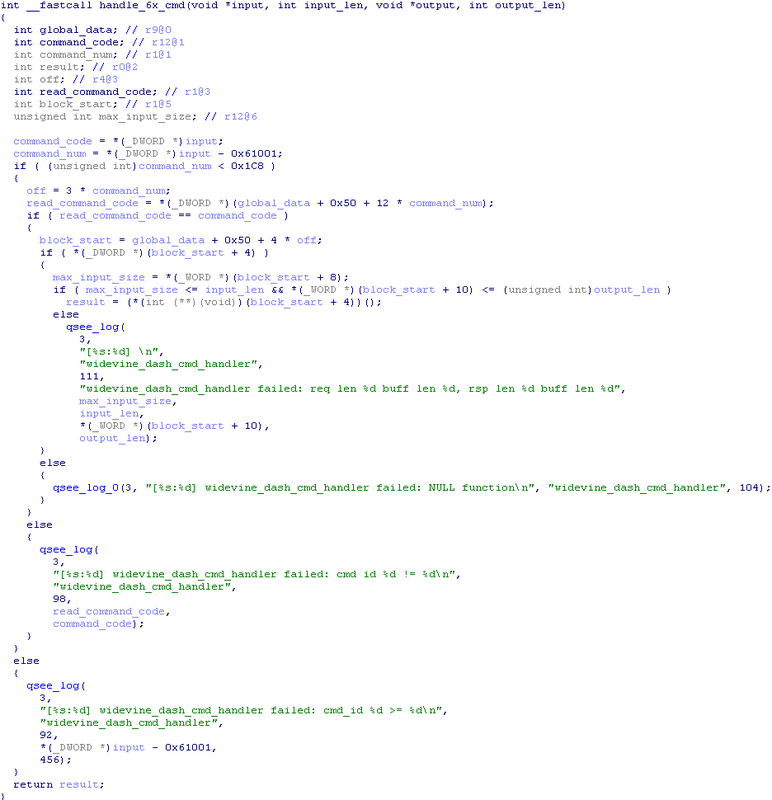 You can use my TZ kernel exploit to read TTBR0 and dump the translation table. 2.It's the exact same process as listed in the ARM VMSA. Nice writing! You mentioned "in fact trustlets can access all allocated memory within the "secapp" region, even memory belonging to other trustlets!". However, in your slides "https://microsoftrnd.co.il/Press%20Kit/BlueHat%20IL%20Decks/GalBeniamini.pdf", you mentioned that "Trustlets cannot access the memory of other loaded trustlets", "Even if they know their loading address within “secapp”". So I wonder, indeed can the trustlets for Qualcomm implementation can access the memory of other trustlets or not? Thanks for reading! As mentioned in the BlueHat IL presentation, trustlets can't access one another's memory ranges, as I later discovered when I was writing the TrustZone kernel exploit. However, the reason I got it wrong in this blog post was that probing the memory ranges in "secapp" didn't always crash, even for addresses that *weren't* in the current trustlet. In hindsight, I think this is because of shared data structures that were located in "secapp", and were readable by the trustlet. The exploit code in the Github is written for device Nexus 6, lmy48m, right? If reproducing the exploit on other devices like Nexus 5, what parameters need to be updated? Only SECURE_APP_REGION_START and SECURE_APP_REGION_SIZE, or a lot of others? Thanks. I also changed the DATA_SEGMENT_OFFSET and DATA_SEGMENT_SIZE (need to -1). But still does not work. Yes, you would need to adjust the rest of the symbols (see symbols.h) to match the exact version of the Widevine trustlet that you're trying to exploit. Other than that, as you've stated above, you'll need to set the secure apps region bounds to match the ones defined in your kernel's dtb. How to Clear TPM Security Processor Firmware The term TPM stands for Trusted Platform Module. If our PC is TPM enabled then it is our first priority to update our security processor. Windows Defender Security Centre regularly sends us the priority message to update the TPM firmware. It can also say us to update the TPM security processor firmware. Sanal para birimi olan bitcoin, bir çok ödeme kanallarını geride bırakarak en fazla tercih edilen yöntem olarak 2018 yılına damgasını vurmuştu. Özellikle sürekli artış göstermesi bir çok yatırımcının ilgisini çekerken son dönemlerdeki ciddi düşüş grafiği Bitcoin’e yatırım yapanlara büyük sıkıntılar da yaşatmaya başladı ancak hala oldukça popüler olan bitcoin sayesinde tamamen gizli ve güvenli bir şekilde bakiye yüklemek ve para çekmek oldukça kolay. Nice article keep it up like this in your future.I hope you do best afford and make future bright. What is the best App Store alternative? Install Tutuapp, the free platform to download games and apps on iOS. Good Job and thanks for the post. Live TV App - AOS TV with all categories channels and channels from around the world.